The snow keeps piling up and a nice snowline is forming for us snow goose hunters this year. On years like this it will make for more opportunities across the board. During the conservation hunts of 2016 and 2017 we had minimal snow cover. The birds were almost entirely refuge focused and blew through most of the Midwest very quickly pushing the ice line. This provided less days of hunting for just about all areas except the Dakotas where the birds piled up into. Now this year is lining up to be different. With a snowline cutting across most of middle america, we should see the geese predictably pushing the snow line. 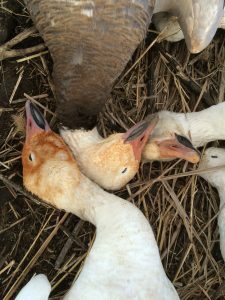 These front edge geese will be in massive sized flocks that you will want to target with as big a sized decoy spread as you can muster. These birds have seen it all but getting there attention and hiding like a ninja is still the first step in tricking them down to the boot bags. Now with a little luck when the snow melts off we will have a good amount of sheet water. One muddy snow goose magnet! But it will be a goose magnet that will hold geese for a long time, especially the juvenile geese that can make for some amazing action. The only downside of this situation is that it will likely be a muddy mess compared to the past couple. This is when a portable setup is key. If you are running socks with a longer stake like our FeatherTek’s it should be no big deal. If you are running full bodies pull out those large seed bags and a massive sled and with some work you will still get the decoys in the ground. No matter what decoy you are running make sure to clean the stakes prior to putting them away unless you will have a muddy decoy come your next hunt. Keep those decoys nice and white for maximum attraction! If at all possible setup on the edge of the sheet water and dry land. Have the wind blowing from the dry land out and over the sheet water. This will have the geese finishing over the sheet water and into the dry land where your blinds are. Run a good number of your decoys into the sheet water with the majority on the edge between the sheet water and the dry land. This setup is absolutely deadly on locally roosted birds and also on migrators! For comfort reason I keep the blinds on the dry land and I also keep anything electronic in the dry area also. Mud and water are terrible on anything electronic!